Customer service from this company is awesome.Driver was nice and friendly .Beautiful and comfortable bus. I would definitely recommend this company to everyone I know! I am very satisfied with my recent service. Everyone was super friendly! Cars were all very clean and beautiful. I booked the antique rolls royce and everyone loved it! Thank you! I rarely ever write reviews but I figured I'd write one today. This review is actually long over due. I booked 2 vehicles for my wedding (antique rolls and a limo). My entire wedding crew was extremely satisfied. They loved the limo and the Rolls Royce. I felt extremely special. The cars were clean and the drivers were nice. They even gave my husband & I a champagne toast! I was impressed. Thank you again!!! I rented a 40 passengers party bus. The bus came ahead of time and the driver was very professional and friendly. Did not give me a hard time what so ever. Will be booking again soon. Thank you! Enjoyed my service. The driver was very polite and kept us updated. I highly recommend this company to anyone who is looking for a limo service. I booked a party bus and a limo and my guests were very please. Thank you. My wedding day was a success. We booked four different vehicles and were satisfied with all four including the drivers. I am very satisfied and will be booking a party with you guys again soon! Thank you. I booked a 30 passengers party bus for my wedding on 01/12/19 and the service went extremely well. The driver was very kind, he let us make an additional stop. He was very patient and friendly. I booked with Sam and his team and I was highly satisfied. I have recommended this company to my good friends. I usually don't post reviews but I just had to seeing some of the negative reviews. I hired this company for my wedding this past weekend and my wedding was amazing! I had no complaints about any of the vehicles or the drivers. Everything went extremely well. Customer service from this company is awesome, cannot complain. Would DEFINITELY recommend to everyone! This company is amazing! I have absolutely no complaints. Everything went perfect for my wedding and I am more than satisfied with the services provided. My husband & I booked a total of 4 vehicles with US Bargain Limo and we had absolutely no issues. Will definitely book something again in the future. Thank you! Despite all my worries, I am such a successful wedding with US Bargain Limo. As brides, we tend to over think things and worry things will all go wrong but nope, everything went exactly as planned! I was so happy. All my guests and I were picked up on time. We rented several different vehicles with US Bargain Limo and experienced absolutely no problems. Everyone was polite and friendly. Thank you for such a great experience. Will definitely book with your company again! Wanted to quickly share my recent experience with US Bargain Limo. I recently booked an antique rolls royce with them and the entire service went great! I find always find myself hesitant to book services as such but I have to say my experience was great! Sam booked me and explained exactly how things would go which put me at ease. I had about 30-35 people and they were all satisfied. We booked 2 vehicles overall. Thank you again. I had to leave this review. Booking with you guys again soon for my son's wedding. Thank you! Hands down one of the best limo companies I have booked with. I am so satisfied with my service and the kindness of all the employees including my driver. Looking forward to booking different services with them! I would highly recommend. I am highly satisfied with my wedding service. We rented 3 different vehicles and all of them were on time and very polite. I had no complaints with the company or the drivers. Thank you again for such a great experience. Will be booking again soon for my birthday! Booked an Escalade Limo with US Bargain Limo last weekend and it went extremely well. I was a little nervous but the company reassured me not to worry. Sam and his team was very helpful, very kind, and they answered any questions I had (and i had a ton). Thank you again for an awesome service!!! I definitely recommend. Booked with US Bargain Limo and I was extremely satisfied with my service. All the employees were great, extremely helpful, and very friendly. I would definitely recommend this company to everyone i know! My wedding service was awesome so I wanted to leave a quick review. Entire staff was awesome, on time, the driver was great & I even received a wine toast for me and my husband so thank you!! Definitely recommend. I highly recommend this company. Bargain Limo was accommodating, professional, clean and most importantly- friendly! Erick, our driver, was professional and courteous! I especially loved the technology, there was wifi set up with YouTube and Spotify that projected to the back TV. In addition, you could plug in your phone! I will definitely be using in the future and recommend to anyone interested!! I had my wedding recently this month in January & I had to look for last minute transportation for my wedding party. Sam suggested getting a party bus to make it a little more fun and he provided me with some great prices! The driver was super professional & all my guests had a great time. I had called three days before my wedding to try and book a Rolls Royce Phantom for my fiance and me. When I called US Bargain Limo, they worked out a great price for me and acted quickly in sending me pics, info, etc. They had exactly what I needed and in such short notice! Great company to book with. I booked a Rolls Royce Vintage Antique car for my wedding day on October 29. The manager Sam was super helpful and worked with me on pricing. On my wedding day, the driver arrived 10 minutes earlier than the time booked which was awesome. The vehicle was beautiful and all my guests were impressed. Over all, I'd definitely book with this company again. 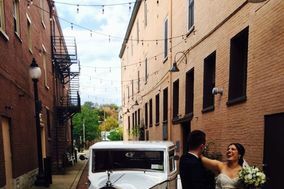 I booked a vintage Rolls Royce and a Coach Bus for my wedding party. They were very helpful in finding something that fits my budget. After booking it, I had a couple of details to change within the timing and my number of guests. They were also very flexible in rearranging details for me. Thank you guys!